A Ladder in a Box? Ballymore's ladder in a box is changing the industry! In January 2011 Ballymore was awarded Patent No. 7,841,447 "Ladder with Removable Step and Method of Storing the Ladder in a Compact Container." 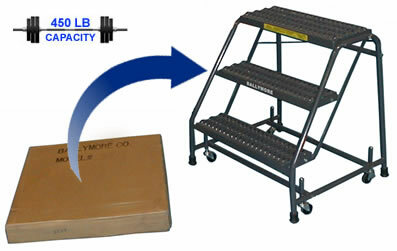 Ballymore Introduces Small Spring-Loaded Ladders in a Box!! One- through five-step ladders ship flat in a box. These ladders are easily stocked and most ship UPS. Available with and without handrails.